“Nice to meet you! What are you Vice President of,” a member asks me at one of our events. “I’m Vice President of the Chapter,” I answer with enthusiasm! “But I thought Arianna was VP,” they reply. “I can see how that can be confusing, Arianna is VP of Special Events,” I say. “Oh… Well what do YOU do,” they ask with a look of confusion on their face. Well, if you’ve ever wondered what is it I do for our organization, now’s your chance to discover the wonderful world of VP! 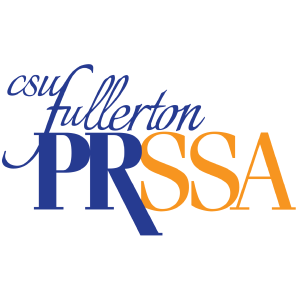 As Vice President of CSU Fullerton’s PRSSA Chapter, I am here to provide assistance to all of our PRSSA members-whether you are a part of our executive board, on a committee, or enjoying your membership benefits from home! Some of my main duties are ensuring members understand all the benefits they get from paying their fees! This can be physical benefits, such as your membership certificates you can show your employers to prove you were an active member of the organization, the special business cards that members who joined Fall 2017 received for our 50th-anniversary celebration, or even how to order your grad sash if you are graduating Spring 2018! I also update members on internships available in the area, as well as coordinating with our executive board on advertising exclusive volunteer opportunities. Behind the scenes, I am our President’s wingman. Whenever he needs assistance in decision making for our chapter, I guide him through and give advice on what our best options are. For our other board members, when someone is unable to perform their duties at an event or during the week, with the help of their President we assist them in finishing their work. Between my duties, as well as assisting others in theirs, I have learned so much in leadership development, human resources, graphic design, pitching, and more that will help me move forward with my career! And what I’ve learned and do not only helps me but can help you! If you ever need help editing your resume, applying to an internship, have any questions about your member benefits, or just want to talk about Disney, don’t be afraid to email me or set up a meeting with me! As your Vice President, I hope we are giving you all that you need and want from our organization! Walk the Walk and Talk that Talk, Professional Development So, What is Public Relations Anyway?